• Band Stand erected in Fort Gardens. • Chimes of the Clock Tower a gift of the late Councillor Alfred Tolhurst. • J.Jennings won the Regatta Boat. • Northfleet United Football Club formed. • St.George’s Church spire repaired at a cost of £1,350 with Westminster chimes added to the clock. • Blizzard caused loss of nine boats and damage to many others amounting to £230. Appeal to the Mayor on behalf of watermen and fishermen. • The Education Department refused permission for a new school in Wrotham Road and would not allow the Gravesend School Board to sell the site. • George Arnold’s excavation at Springhead produced Roman remains, suggesting the site was probably known as “Vagniacae”. • Workshop of Hopkins builder, Milton Road, destroyed by fire. • A 7-foot sturgeon caught off Lower Hope. Exhibited at Beichteller’s shop in Windmill Street, before being sent to a member of the Royal family. • Memorial stone of St. Andrew’s Grove Mission, Prospect Place laid. • Population of Gravesend and Milton 24,076. Population of Northfleet 11,717. • Twin-screw ship “Carlotta” purchased for the Gravesend to Tilbury ferry. • Royal Terrace Pier and barge found unsafe - pilots given notice to quit. • Maypole Dairy Co. Ltd. opened a shop in the High Street. • Public Library Act adopted by the Borough. • Walkers Brewery became Walker & Sons, Wellington Brewery. • A statue of General Gordon was erected in the Gordon Gardens. The funds being raised by public subscription. • J.Murphy won the Regatta boat. • Technical Institute, Darnley Road opened by Princess Beatrice of Battenberg. Streets decorated and triumphal arch erected in New Road. Subjects taught were Art, Science and General subjects, with classes mainly in the evenings. The following year two rooms in the Institute were used as a public library, until 1905. • Gravesend united Football Club formed (amalgamating Gravesend Football club and Gravesend Ormonde). • A fire in West Street caused the total destruction of the towns flour mills. • Restored Royal Terrace Pier re-opened. • Wrotham Road Board School opened with 200 boys, 200 girls and 288 infants. • Northfleet Urban District Council created by Act of Parliament, superseded “Northfleet Local Board of Health”. This local government act also established Parish Councils. • G.Batch won the Regatta boat. • The Windmill, which was used as an observatory on Windmill Hill, became derelict and was pulled down because it was dangerous. • Major alterations to St. George’s Church, increasing the seating capacity by 280. 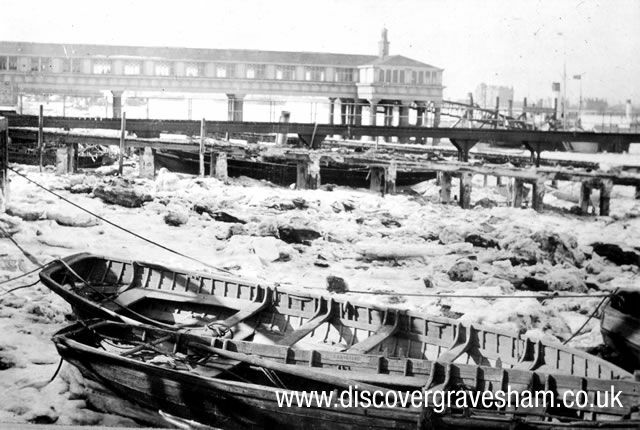 • Gravesend Sailing Club founded. • Lord George Sanger’s famous Circus came to Gravesend. • New wards at Gravesend Hospital were opened by the mayor at a cost of £6,359. • River obstructed by large ice floes due to a great frost, which occurred in February. Temperatures failed to rise above 230F (-50c). There was ice skating on the canal. • E.Winn won the Regatta boat. • Knight’s Almshouses, Perry Street, founded by Mr & Mrs Knight. • The first meeting of the new Northfleet Urban District Council took place in May. • Sudden death of the 6th Earl of Darnley occurred on his Irish estate. • C. Walter won the Regatta boat. • Statue of Queen Victoria in Gravesend Market presented by G.M.Arnold. • Extensive alterations to the Town Hall buildings and the rebuilding and extension of the market began. • A co-educational Municipal Day School opened to provide secondary education, in the Technical Institute buildings, Darnley Road, which had been mainly used in the evenings. • Northfleet United Football Club amalgamated with Gravesend United as both clubs had financial difficulties. Amalgamation only lasted 5 years. • Gravesend works of what was later to be known as the Amalgamated Press, established on a site adjacent to the Rosherville Gardens. • J.Watkins won the Regatta boat. • The Association of Portland Cement Manufacturers (APCM) was founded from the combined cement factories which had become established at Greenhithe, Swanscombe and Northfleet. • The year was marked by arguments concerning the respective merits of gas and electricity. During the year the Corporation agreed to the use of electricity for lighting and tramways. • Gravesend and Northfleet Tramways Ltd. was formed. Horsedrawn trams ceased running to prepare for electrification. Reconstruction of tramway commenced at Northfleet. • The “Rose” entered the Tilbury Ferry Service. • Rosherville Gardens was put up for auction but there were no bidders. • St. Mary’s Chapel, Denton was restored by G.M. Arnold. • Steam Navigation vessel “Plover” sank off Terrace Pier, Gravesend after a collision with Furness liner “Appomatox”. • Public procession and services in memory of Queen Victoria took place. • Emperor of Germany with Crown Prince and suite passed through Gravesend on their way to Port Victoria, Isle of Grain. • Local Government Board inquiry at Gravesend Town Hall regarding “inadequacy” of sewers. • A 5 year old school child was run over and killed by a motor car in London Road, Northfleet - estimated speed 9 m.p.h. • Three bullocks rushed into Woodford’s wine and spirit shop, Milton Road, Gravesend and smashed several bottles before being chased out. • New premises of London and County Banking Co. opened in Gravesend at the corner of Windmill Street and King Street. • New steam fire engine was purchased in October. • Channel and River Pilots Services merged under joint committee. • Large balloon from Crystal Palace made emergency landing near the “Ship and Lobster” at Denton. • Official opening of the new Northfleet Board Schools, Old Dover Road. • Population of Gravesend and Milton 27,196. Population of Northfleet 12,906. • Electricity installed by Gravesend Town Council and electric trams replaced horse trams. Gravesend and Northfleet Tramways Co. opened lines. The main line ran from Galley Hill, Swanscombe to Denton. • Gravesend Borough Education Committee formed, replacing the School Board. • A new science wing was added to the Municipal Technical School and Day School, Darnley Road. • A serious fire at Milton Mount College, Gravesend. • A fire at Gravesend Workhouse. • Lord Mayor of London arrived in state to open Windmill Hill Pleasure Grounds, Gravesend. • Gravesend’s Mayor and Town Clerk entertained to luncheon with the Prince of Wales at the Mansion House. • Peace celebrations to mark the end of the Boer War were held at Gravesend and Northfleet. • Grand Duke Michael of Russia landed at Gravesend to attend the coronation of Edward VII. • Gravesend M.P. Gilbert Parker was knighted. • Coronation festivities were held in Gravesend in July. Mayor Cooper attended the Coronation Ceremony at Westminster Abbey in August. The town was decorated and illuminated. • The extended Promenade formally inaugurated.